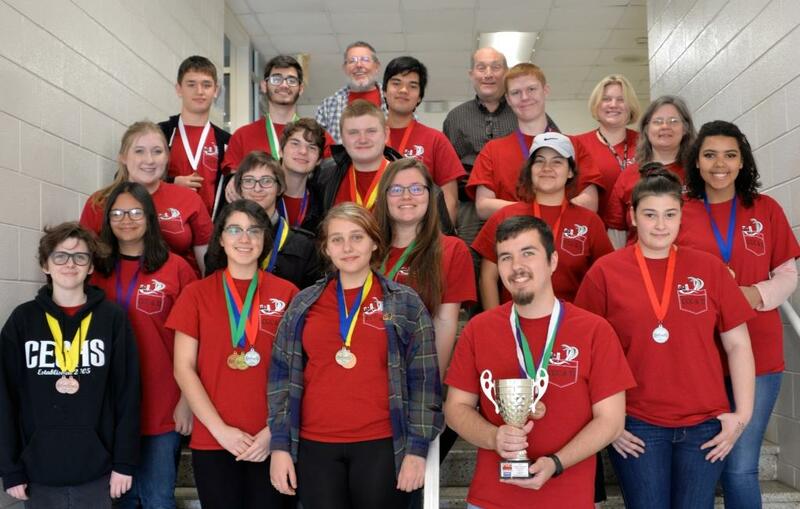 HUDSON, NC (March 20, 2018)…Students from the Caldwell Early College High School (CECHS) and the Caldwell Career Center Middle College (CCCMC) recently participated in the North Carolina Science Olympiad Hickory Regional Competition and brought home several awards. The CECHS Team took Second Place overall with 16 students winning individual medals, more than any other team competing. Their performance at the regional competition has won the CECHS Team the right to move on to the statewide Science Olympiad competition to be held in April at North Carolina State University in Raleigh. Pictured are members of the Caldwell Early College High School and Caldwell Career Center Middle College 2018 Science Olympiad Teams. The CECHS team took 2nd Place overall at the Regional Competition and won individual medals in 16 events. The Team will compete in the statewide Science Olympiad Competition in April at NC State University in Raleigh. North Carolina Science Olympiad (NCSO) is a nonprofit organization with the mission to attract and retain the pool of K-12 students entering science, technology, engineering, and mathematics (STEM) degrees and careers in North Carolina. Every year NCSO hosts tournaments on university, community college, and public school campuses across the state. These tournaments are rigorous academic interscholastic competitions that consist of a series of different hands-on, interactive, challenging and inquiry-based events balanced between the various disciplines of biology, earth science, environmental science, chemistry, physics, engineering and technology. In 2017, more than 900 K-12 teams representing over 18,000 students and 85 counties in North Carolina participated in NCSO activities. All of the students who participated in the regional event have been involved with CCC&TI’s Science Club and have been preparing for competition since August 2017. Students have also worked to raise the funds needed to participate in the competition. At the state competition in April, the CECHS Team will be competing for a chance to move on to the national tournament in Colorado. Following are lists of participants in this year’s competition.